The CH711’s cables are hidden within its white stand, which makes it easier to flip the display vertically, though having such an extreme curve could make using this orientation a bit off-putting. Also at CES will be Samsung’s other curved Quantum Dot monitors: the recently released CFG70 and CF791. The gamer-focused CFG70 is available in 23.5-inch and 27-inch sizes. It comes with a 144 Hz refresh rate, Freesync, a 1ms response time, 1080p resolution, and a host of gaming features. The 34-inch CF791, meanwhile, also features FreeSync, has a 3440 x 1440 resolution, a 4ms response time, and 100 Hz refresh rate. After trying Mirror’s Edge on the latter monitor at this year's IFA, it became one of our top picks from the event. Also at CES will be Samsung’s upcoming flat monitors, which includes another model aimed at gamers: the 28-inch UH750. This Quantum Dot display boasts a 4K resolution, a 1ms response time, and a slim, narrow-bezel design. “Today’s multimedia consumers, quite rightly, have high expectations and demand a truly cutting edge, totally immersive experience that realizes the full potential of whatever they are playing or watching. 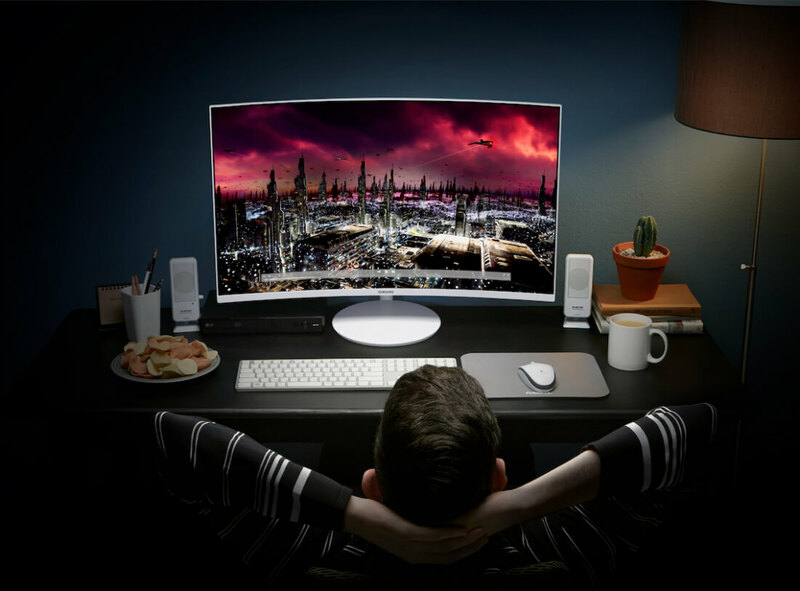 This year’s line-up of curved Quantum Dot monitors offers brilliant design, richer color and deeper contrast than ever before. We can’t wait to share them with the world at CES 2017 in Las Vegas,” said Seoggi Kim, Senior Vice President of Samsung Electronics’ Visual Display Business. The CH711 is scheduled for an early 2017 commercial release, but there’s no word yet on pricing.